Located only 10 miles from Myrtle Beach, *Seawatch Landing* is a great place for those in search of pure relaxation and dramatic sunset views. From your balcony, see Murells Inlet, the on-site outdoor pool, whirlpool, sun deck, boat launch, and picnic area. Bring your fishing pole and drop a line into the inlet, which is a haven for anglers and water-sports enthusiasts. The area is one of the nation's leading golf centers, with nearly 100 courses from which to choose. Other area attractions include the famous Myrtle Beach Boardwalk, Brookgreen Gardens, and historic Georgetown. Anglers, water-sports & golf enthusiasts rejoice! Yearly usage in January week 2! Reasonable offers considered! 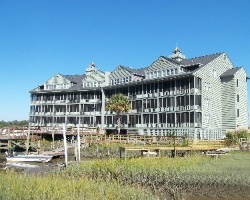 Week 10 at this lovely resort, located only 10 miles from Myrtle Beach! Peace and relaxation await you! Spring/ fall season wk 14, choose between wk 1-15 & 42-52! Sale includes 1 banked wk! Buyer May Receive A Title Fee Credit, Inquire for Details!